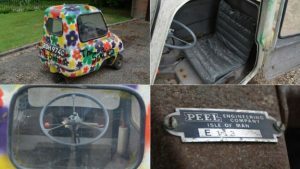 A rare microcar manufactured in the Isle of Man in the 1960s has been sold for £49,500 at a UK auction. The P50 three-wheeler, made in 1963 by Peel Engineering, went under the hammer at Brightwells in Leominster, Herefordshire. Only 50 of the 49cc cars were ever made, with fewer than 30 thought to remain. An immaculate example was sold at auction in the US in 2016 for a world record $176,000 (£120,000). 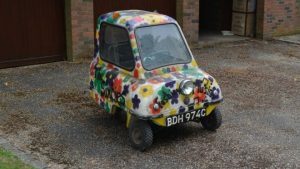 The car’s previous owner bought it for his daughter in 1978 and was used at village fetes and for her A-Level art project. ‹ Manx Celtic Festival Celebrates Fortieth Anniversary!